The Manor is the official student yearbook for Fairfield University, commemorating people, events, and campus life at Fairfield University with a focus on graduating seniors. This collection features Fairfield University student newspapers, including the Tentative, Fulcrum, Stag, and selected issues of the University Voice. Fairfield University Course Catalogs contain course descriptions for all undergraduate and graduate programs. They also often include admission and degree requirements, tuition and fees, a faculty directory, the academic calendar, as well as information on university history, administration, and services. Our growing collection of historical photographs offers images of faculty and students, university architecture, campus life, and special events at Fairfield University. The Fairfield University Oral History Collection makes available selected transcripts of conversations with Fairfield University&apos;s earliest founders who helped to establish and foster the growth of the institution. This collection consists of film and video material of events, interviews, and news clips related to the development of Fairfield University. This collection features institutional histories and factual information specific to the development of Fairfield University. It includes historical monographs, reports, theses, and fact books. Sports and Athletics endeavors to serve as a repository of archival items for the varsity teams and club sports at the university. At present it includes scrapbooks, trading cards, media guides, and sport programs. This collection consists of promotional posters and flyers for Fairfield University concerts, lectures, and other events as a reflection of the daily life of the campus. This collection includes programs and brochures related to special events on campus, such as dedication events, concerts, lectures, and art exhibitions. This collection features selected letters, speeches, addresses and video transcripts housed in the Fairfield University Archives and Special Collections. The John Henry Newman Collection consists of three handwritten notes and a poem, as well as 40+ books by or about Cardinal John Henry Newman (1801-1890). The New York Giants football team held their summer practice on Alumni Field from 1961 through 1969 and also in 1974. Photograph: Spider Lockhart with a group of fans in August 1966. 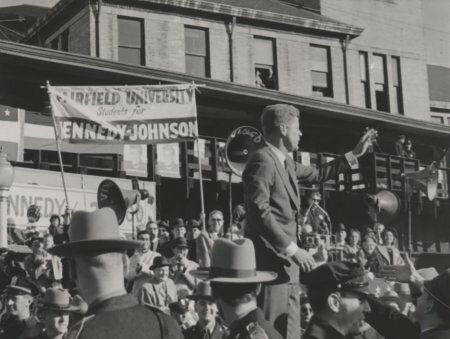 For more fun facts on Fairfield University&apos;s history, visit our 75th Anniversary Timeline. Are you as smart as the Class of 1963? Check out the General Electric College Bowl, a live NBC TV quiz show featuring four of our brightest students from 1963! Includes original commercials. Click on the image above to view! If you own copyright to materials and feel you have not been properly identified, we ask that you immediately contact the University to help us clarify the issue and update our records and online holdings. Persons who have questions or who wish to contest the use of specific works may contact the Fairfield University Archives & Special Collections at digital@fairfield.edu. Please see the Policies section of the library website for more information.